Is Team India divided or has the defeat in two Tests in Australia and four in England caused fissures in the team? Or as in the past, Australia is playing mind games and our cricketers should not be bothered at all? 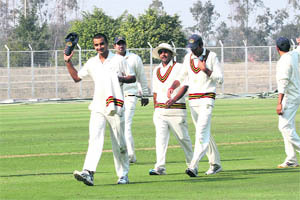 Virender Sehwag is the vice-captain of the Indian team. "Haven't you got a mail to shave off the pitch?" - senior batsman Rahul Dravid asked the curator as the Indians assembled for their first practice session at the famed WACA ground ahead of the do-or-die third Test against Australia starting on Friday. A war of words broke out on Tuesday between Indian and Australian cricketers ahead of the crucial third Test with senior players of both sides taking digs at each other after Brad Haddin started the jibes by calling India a "fragile" team. Zaheer Khan has hit out at Australian wicketkeeper Brad Haddin. Baichung Bhutia could not have asked for a better farewell than this, never mind the 4-0 spanking India got at the hands of Bayern Munich, in front of a well-packed Jawharlal Nehru Stadium here tonight. Argentina and Barcelona forward Lionel Messi, still only 24, won the World Player of the Year award for the third time in a row on Monday. Real Madrid's Portuguese forward Cristiano Ronaldo was second in the vote for the 2011 FIFA Ballon D'Or and Messi's Barcelona team mate Xavi third. The 22-yard strip at the Bansi Lal Stadium in Lahli turned out to be a minefield for both Rajasthan and Haryana batsmen as 18 wickets fell on the first day of the Ranji Trophy semi-final. If young Harshal Patel's eight for 34 saw Rajasthan being skittled out for 89, the defending champions had another youngster in Rituraj Singh who took five for 36 to reduce the hosts to 82 for eight at stumps on first day. Thierry Henry needed just over 10 minutes to mark his Arsenal return with the winning goal as Leeds United were edged out 1-0 at the Emirates Stadium in the FA Cup third round. The former France international, 34, left the Gunners in June 2007 as the club's record goal-scorer and returned last week on a two-month loan from New York Red Bulls. Sant Baba Bachan Dass Club won the district level hockey tournament organized by Himachal Hockey Association at Indira Ground here on Tuesday. In the final match of the tournament played here today, Sant Baba Bachan Dass Club defeated Guru Nanak Club 3-2. SYDNEY: Top-ranked Caroline Wozniacki came back from 4-0 down in the final set to beat Dominkia Cibulkova of Slovakia 7-5, 2-6, 6-4 on Tuesday and advanced to the quarterfinals at the Sydney International. An article in Australian newspaper Herald Sun says, "Virender Sehwag is the man polarizing opinions in the Indian rooms." The paper quotes Australian pacer Ryan Harris as saying that the "Indians were fighting among themselves" and the team does not have unity. According to the article there is a division in the team on who should captain the Indian team. According to the report, some players are in favour of Sehwag as captain while a section wants Mahendra Singh Dhoni to continue as skipper. The paper also talks about former Indian coach Greg Chappell who had observed in his autobiography Fierce Focus that young members of the team were too afraid of some of their seniors to speak in the team meetings. Meanwhile, Australian vice-captain Brad Haddin has taken aim at struggling India, saying the tourists "break quicker than anyone in the world" and turn on each other when things are not going their way. Wicketkeeper Haddin turned up the heat on India, trailing 2-0 ahead of Friday's third Test in Perth, by revealing that Australia had discussed the tourists' mental frailties. "We spoke about a bit of that when we were batting," Haddin was quoted as saying in the Sydney Morning Herald. "The longer we could keep them out on the field the bigger chance we had of breaking them." "We know this side can be as fragile as any team in the world if things aren't going their way and they can turn on each other and the media turns on them pretty quick." WACA curator Cameron Sutherland has stated that the world's fastest pitch is likely to stay true to its nature and be a pacer's delight come Friday. "Haven't you got a mail to shave off the pitch?" said Dravid jocularly to Sutherland after having a look at the completely green turf which has been picked for the Test. The reputation of the pitch has preceded the Test and the Indians, as a batting bunch, looked to have more than one worry to deal with as they put their first session together on Tuesday. For a starter, new balls were used by both regular and net bowlers to the batsmen - possibly the first time it's been done so on the tour. New ball has caused the maximum damage to batting units on this tour and the WACA pitch could provide more of the same given the pace and bounce everyone is promising on the turf. The two openers, Virender Sehwag and Gautam Gambhir, were filmed from close quarters as their technique was closely monitored. Sehwag even let a few deliveries go outside the off-stump which is an indication how the swashbuckler wishes to avoid the trap laid for him outside the off-stump. In the series so far, Sehwag has been caught cutting deliveries to the slip cordon and the temptation has proved too irresistible for him to let go the deliveries outside the off-stump. Though he has hit a half century, and so has Gambhir, they have never really looked comfortable against Australian quicks in the first two Test matches. Another noticeable aspect of the nets was the time Sachin Tendulkar spent with Ishant Sharma in trying to sort out his bowling technique for the Australian wickets. Sharma has generally bowled a little short in the first two Tests and has had a mere three wickets at a whopping average of 78.33. Tendulkar repeatedly told the youngster to let his bowling arm finish by the side of his right thigh. The emphasis was to bowl deliveries which "kiss" the surface rather than hit-the-deck kind of stuff which sails past the bats harmlessly. "You will keep bowling such stuff and batsmen will keep leaving them," was the clear message of Tendulkar. Dravid was keen and eager at the nets, first handling the throw-downs from Trevor Penny and then facing Ishant Sharma, bowling at full tilt at him. Quite a few times Penny would motion as if it is a throw-down and then not deliver -- only to gauge how Dravid had moved his bat and feet in anticipation. 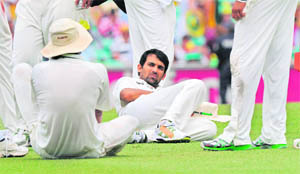 Apparently, Dravid didn't look quite pleased from where his bat is coming down to meet the delivery. On Monday, Haddin had fired the first salvo stating that the struggling Indians tend to "break quicker than anyone in the world" when things don't go their way. It got an angry response from Indian pace spearhead Zaheer Khan, who asked Haddin to focus on his own "fragile" wicket-keeping skills. "Haddin needs to worry about his keeping. It appears really fragile to me and he needs to start moving," he said. Equally sharp was the reaction of Australian pacer Peter Siddle, who felt the Indian left-arm pacer had got it all wrong. "Zaheer saying he (Haddin) has got to concentrate on his keeping, I wouldn't like to see how good his (Zaheer) tips are on keeping. "I don't think it's his place to say that either... Obviously Zaheer is going alright at the moment and he likes to say those things," he said. Zaheer said Haddin's comments were aimed at playing mind games with the tourists, who trail the Test series 0-2. "He's doing all the talking. He's definitely playing his role." Haddin had stated that, "We know this side can be as fragile as any team in the world if things aren't going their way and they can turn on each other and the media turns on them pretty quick," he was quoted by the media here. "We knew if we could keep them out there and put the numbers like we did on the board we knew we'd get the rewards because they break quicker than anyone in the world." Meanwhile, Zaheer also took a swipe at former Australian captain Ricky Ponting, saying although he scored a century in the second Test in Sydney, he didn't look the batsman he used to be. "All I can say is that he (Ponting) applied himself well. But the Ricky Ponting of old...the flair is different now. He was more of a grinder and it wasn't his natural game. But a hundred is a hundred and all credit to him." Bayern Munich, the German giants, indeed, were a class apart, and they did not seem to expend much energy while tormenting and torturing the Indian ranks on way to a facile win, with all the goals coming in the first half. The goal-flow started in the 13th minute, after Karanjit Singh had baulked a couple of attempts, when Mario Gomez slotted in off a Thomas Mueller pass. That was in the 13th minute, and three more goals came in the next 30 minutes. Arjen Robben set up the second goal, when he got the better of Clifford Miranda to chip the ball high into the box where Mueller himself was positioned well to head in, past a clueless Karanjit. Mueller scored the third goal too, this time cashing in on a chipped pass from Toni Kroos, while Bastian Schweinsteiger curled the ball into the roof of the net to add the fourth goal a minute before the first session. And just before the break, Karanjit came up another stop off a Gomez header. Remember, it was a club vs country contest, yet Bayern were all over the Indian goal area in the first half, to show the kind of clout they have in the game, and why they are among the top five in European soccer. All goals were gems, works of craftsmanship, as the visitors showed how to convert chances into goals with perfect understanding among the forwards. After taking an unassailable lead Bayern made wholesale changes in their attacks, even pulling out captain Philipp Lahm, giving some leverage for the Indian attackers to make forays past the half line. But the gap in the class was still so lop-sided that India had just four goal attempts, compared to 20 by Bayern. India forced two corners and Bhutia’s long sally over the rival goal was his only firm, but failed, attempt to score. Bhutia was feted and presented a clutch of presents, starting with a jersey with his name embossed, by Bayern skipper Lahm. All India Football Federation (AIFF) president Praful Patel was present to honour Bhutia, which was a rare occurrence, as Patel had not thought it fit to come to the Nehru Stadium, even for once, when the country hosted the SAFF Championship at this venue a few weeks ago. And when Bhutia walked out of the field after donning the national colours for one last time, barely 10 minutes before the final hooter, the packed stadium rose in union to give him a standing ovation. It was a mismatch no doubt, but not to the extent of being a total wash out as had been feared by India. Perhaps, the goal count was restricted to a tolerable level as the visitors did not go full throttle. There was no need to, as in the first half, India hardly got to play the ball, but for a long try over the Bayern goal by Bhutia. Messi, who inspired his Spanish team to win the Champions League, La Liga and Club World Cup, was also first last year when the award was created by joining together the separate annual prizes handed out by FIFA and France Football magazine. "To win it three times running is a very big honour," Messi, who also won both old awards in 2009, told the audience after being presented with the trophy by former Brazil striker Ronaldo a three-time World Player of the Year. The 22-yard strip at the Bansi Lal Stadium in Lahli turned out to be a minefield for both Rajasthan and Haryana batsmen as 18 wickets fell on the first day of the Ranji Trophy semi-final. If young Harshal Patel's eight for 34 saw Rajasthan being skittled out for 89, the defending champions had another youngster in Rituraj Singh who took five for 36 to reduce the hosts to 82 for eight at stumps on first day. The Bansi Lal Stadium track has always assisted the seamers especially at this time of the year. Thierry Henry needed just over 10 minutes to mark his Arsenal return with the winning goal as Leeds United were edged out 1-0 at the Emirates Stadium in the FA Cup third round. The former France international, 34, left the Gunners in June 2007 as the club's record goal-scorer and returned last week on a two-month loan from New York Red Bulls. He could hardly have made a more impressive comeback, showing his colleagues how to finish after Leeds, currently eighth in the Championship, held out stubbornly until the 79th minute, 11 minutes after Henry had come on to a rapturous welcome from the home fans. It was his 227th Gunners goal and Arsenal's reward is a fourth round tie at home to Aston Villa. "It's kind of weird, I only came back from holiday in Mexico 15 days ago, I never thought I was going to be playing for Arsenal again and then score the winner," he told ESPN. In the three-day tournament nine teams participated. The Chief Patron of Himachal Hockey Association, Ram Lal Thakur, gave away prizes to the winners. The vice-president of Una Hockey Association, Kushal Singh Raini said Una has produced a few international hockey players despite limited infrastructure available for the sport here. Padam Shree Awardee Charanjit Singh and Deepak Thakur belong to Una.